(CNN) -- The U.S. military is distributing pamphlets in eastern Afghanistan in an effort to find a soldier who has been missing for more than two weeks, the military said Thursday. 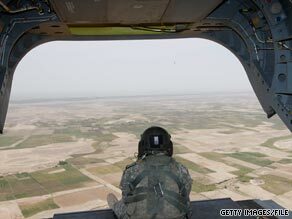 A soldier mans a weapon at the rear of a U.S. Army helicopter over Afghanistan in May. The Taliban has claimed responsibility for kidnapping the soldier, who has not been identified, along with three Afghan soldiers. All went missing on June 30 in southeastern Afghanistan. The military believes the soldier may have been moved to various locations, including across the border into Pakistan, U.S. military officials said. There are two versions of the pamphlets, which are in the Pashto language and were made available to CNN by U.S. Forces Afghanistan. One shows the image of an American soldier shaking hands in a group of kids with the message, "One of our American guests is missing. Return the guest to his home. Call us at ..." and lists a phone number. The other shows a U.S. soldier kicking down a door, and then an outstretched hand with the superimposed image of a soldier, his head and arms drooping, and the words, "If you do not release the U.S. soldier then ... you will be hunted," Capt. Elizabeth Mathias, a U.S. military spokeswoman, said Thursday. Soldiers have posted and handed out the pamphlets across Ghazni and Paktia provinces over the past 24 hours, Mathias said. Days after the soldier went missing, a senior U.S. military official said, he and the three missing Afghan soldiers were captured by low-level militants and then quickly "sold" to the clan and network led by warlord Siraj Haqqani, who is believed to be deeply involved in the action. The Haqqani clan operates on both sides of the Afghan-Pakistani border and is well known to the U.S. military. The soldier apparently left his small outpost on his own on June 30 with no apparent means of defending himself, the official said. Taliban commander Mulvi Sangeen said the U.S. soldier visited a military post in the Yousaf Khel district in Paktika province, got drunk, and was ambushed while returning to his car. Sangeen said the soldier was taken to a safe place. Paktika and Paktia provinces are adjacent. CNN could not independently verify Sangeen's claims. A source with the U.S. military denied the claim that the soldier was drunk. "The Taliban are known for lying, and what they are claiming [is] not true," the source said.